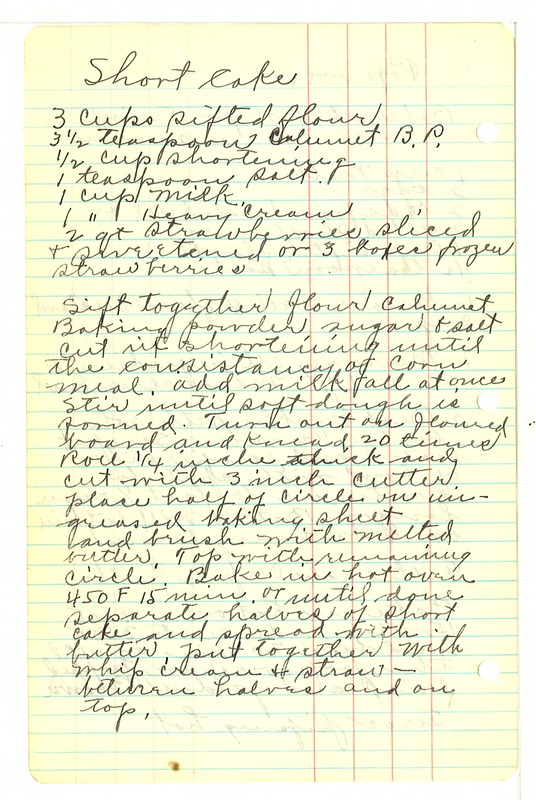 Short Cake 3 Cups sifted flour 3 1/2 teaspoon Calumet B.P. 1/2 Cup shortening 1 teaspoon salt. 1 cup milk. 1 " Heavy cream 2 qt strawberries sliced & sweetened or 3 boxes frozen strawberries Sift together flour Calumet Baking powder sugar & salt Cut in shortening until the consistency of Corn meal. add milk all at once Stir until soft dough is formed. Turn out on floured board and knead 20 times Roll 1/4 inch thick and cut with 3 inch cutter. place half of circle in un- greased baking sheet and brush with melted butter. Top with remaining circle. Bake in hot oven 450 F 15 min or until done separate halves of short cake and spread with butter, put together with whip cream & straw - between halves and on top.